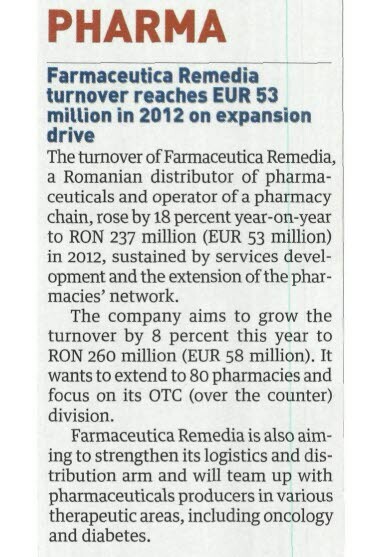 The turnover of Farmaceutica REMEDIA, a Romanian distributor of pharmaceuticals and operator of a pharmacy chain, rose by 18 percent year-on-year to RON 237 million (EUR 53 million), sustained by services development and the extension of the pharmacies’ network, writes Business Review in 22.01.2013 edition. The company aims to grow the turnover by 8 percent this year to RON 260 million (EUR 58 million). It wants to extend to 80 pharmacies and to focus on the OTC (over the counter) division. Read the full article.